Deep in the "Heart of Dixie," many people think that life moves at a slower pace. Maybe it's the heat, or something else altogether, but Alabamans lead a relaxed life in most cases. While the heat may slow the pace of the daily grind, Alabama is no slouch when it comes to economics. In the post-World War II boom, Alabama became home to strong finance, manufacturing, aerospace, mineral extraction, and technology businesses. As a result, today it is one of the more popular choices for individuals and groups looking to incorporate a business. Incorporating any business in the United States offers the benefit of separate the personal assets and property of the individual owner from the assets and liabilities of the business. In the state of Alabama, C-corps and LLCs are allowed to separate assets and liabilities of the business from those assets of the owner, providing a great benefit to foreign entrepreneurs in particular. While other states have even lower taxes and annual fees for corporations, Alabama has created one of the best environments in the country for business establishment and growth. The state collects two types of taxes on businesses incorporated in the state. The privilege tax is collected on any C-corp or LLC formed in the state. Corporate income taxes apply only to C-corps, though Alabama allows LLCs the freedom to subject themselves to a corporate taxation should they choose to do so. Like many other business-friendly environments across the country, Alabama has no residency requirement for individuals incorporating in the state. Neither you nor any directors within your newly formed business have to live in the state of Alabama. 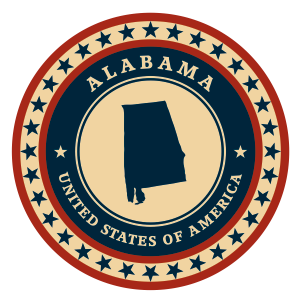 All you need to incorporate in Alabama is a registered agent with an address in the state. The registered agent may be a person or corporation, and must have a registered office address. For foreign entrepreneurs, opening a US bank account lends credibility to the business and makes it easier to engage in business (both brick-and-mortar and ecommerce) in the US. A bank account gives you access to debit cards, checks, and merchant service accounts that are necessary for business operations. No C-corp or LLC incorporated in the state of Alabama can have a name that could be confused with another business already operating in the state. This stipulation protects your business brand and provides a unique identity for your product/service. In addition to that, you have the flexibility to state a corporate purpose in general terms. This means that your company’s purpose and goal can change over time without having to file any additional forms with the state. Limited liability corporations must have distinctive names ending with “Limited liability company”, “LLC” or “L.L.C.”. There are no restricted or prohibited name designations for Alabama LLCs. If you decide to incorporate an LLC in the “Cotton State”, then you must file a formation document called the Articles of Organization. Filing the Initial Business Privilege Tax-Return report and an Annual report with the Department of Revenue is also required within 3 and a half months from the date of incorporation. LLCs incorporated in Alabama may be asked to undertake filings at the county level, prior to incorporation. The Articles of Organization must contain the name and address of a registered agent who owns a physical Alabama address and who is available to manage legal and tax documentation. Inc. Plan (USA) can help you with the necessary filings and also with qualified registered agent service. LLCs incorporated in Alabama (both foreign and domestic) are classified by the state law as being partnerships for Alabama tax purposes. Therefore, LLCs will not be charged based on their net income, but their members must include their distributive share of revenue in their own taxable adjusted gross income. Also, LLCs are subjected to a minimum privilege tax of $100, and an EIN is required for companies with employees. Each of the 50 American states has its requirements for incorporating. Essential requirements for C- corporations established in Alabama are as follow. The allowed name designations for businesses incorporated in Alabama are “Corporation” or “Incorporated” and their abbreviations “Corp.” or “Inc.”. However, there are some designations which are restricted and need special approval from the state authorities, like “Bank”, “Banking”, “Electric”, “Engineering”, “Insurance” or “Trust.” If you need help with choosing the right incorporation name check our free corporate name search section. In order to form a corporation in Alabama, entrepreneurs must file a document of formation called Articles of Incorporation. Alabama state law requires the filing of an Initial Business Privilege Tax-Return report and an Annual report with the Department of Revenue within 2 and a half months from the date of incorporation. With 67 counties in Alabama, companies may be required to undertake filings at the county level, prior to incorporation. The Articles of Incorporation must include the names and addresses of the company’s managers, and also, the name and address of a registered agent with a physical address in Alabama. Also, shares and par value must be specified in the Articles of Incorporation. Filing extensions for the Annual reports is also permitted and is available for six months. Inc. Plan (USA) can help you with the necessary filings and also with qualified registered agent service. Both domestic and foreign Alabama corporations are subjected to an income tax of 6.5 % of net income and a minimum $100 privilege tax. However, if you are a multistate business conducting only sales activities without owning or renting realty or personal properties in Alabama and with a gross sales volume that doesn’t exceed $100 000, then you can choose an income tax at the rate of 0.25% of the sales’ volume. If you plan on hiring, Alabama law will ask you for a tax identification number (EIN).